What is Half Gallon Champion? 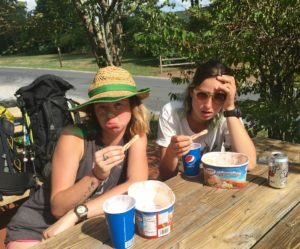 Half Gallon Champion is an illness that occasionally strikes hikers halfway into their thru hike. It has an extremely short incubation period, with symptoms appearing almost immediately and lasting several hours. There is no cure, but treatment may lessen symptoms. Abstinence is the only definite way to prevent Half Gallon Champion, though those who choose this method may be ridiculed and considered weak by their peers. Overconsumption of ice cream, typically sixty-four ounces or more. All thru hikers who have made it to the Pine Grove Furnace General Store in Pennsylvania. Most cases of Half Gallon Champion can be self-diagnosed without seeing a doctor, but consultation with cashiers may be necessary. Seek medical treatment if symptoms persist. Psychological appeasement is the most common method of treatment, typically administered in the form of a winner sample spoon. Other symptoms may be eased with water, cool air, and sprawling on the sidewalk, though no medical studies have proven their effectiveness. Most cases of Half Gallon Champion typically clear on their own in several hours. Most people with Half Gallon Champion go on to live completely normal lives without relapse. Some patients have reported lingering feelings of superiority and pride, but more research is needed on this subject. Trail name Sonic. I roll down hills and collect coins and my hair isn't even blue. Cute, fun post! Love it.